There is mounting interest in the study of circulating biomarkers – namely, molecular entities that are found in various biological fluids in vivo. This interest in large part is driven by the fact that these molecular entities represent a snapshot of the in vivo situation – physiological or disease states – and can be easily harvested via collection of biological-fluids in a minimally invasive manner (urine collection, a blood draw, a lumbar puncture, for instance). Circulating DNA – This is produced by dying cells in vivo and is most-closely associated with cancer since tumors tend to undergo necrotic cell death and this releases circulating tumor DNA (ctDNA) which contain the somatic mutations found in the tumor and can be studied via next generation sequencing for instance to identify the types of mutations present. Many studies have demonstrated that the amount of circulating tumor DNA is correlated with progression of the cancer process and furthermore the capture of ctDNA scales across many types of cancer – this suggests that ctDNA may be a powerful circulating biomarker for cancer liquid biopsy development. 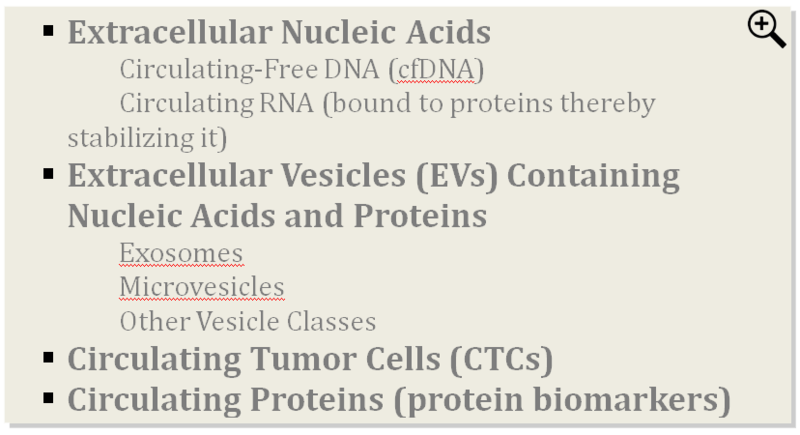 Circulating RNA – This is found in a free form in biofluids complexed to proteins or found enveloped within vesicles [see below – last category]. Both long and short RNAs comprise the category; the former may be mRNAs or long non-coding RNAs (lncRNAs) and the short RNA category represent the microRNAs. Given that the expression of RNA is associated with tissue specificity as well as intracellular metabolic changes, it is believed that the capture and analyses of RNA species from biofluids will yield insights into the in vivo state. Circulating microRNAs, for instance, reflect changes taking place in the tissue from where they are derived and signatures of microRNA expression profiles are correlated with disease processes most notably various classes of cancer. miR-21 for instance is up-regulated in solid tumors and is also detected in biological fluids. Circulating Tumor Cells (CTCs) – This category of circulating biomarker represents cells sloughed-off from the primary tumor, which perhaps serve to seed secondary metastases at distant sites. There is still controversy in the literature as to the origin of CTCs and their functional role vis-à-vis progression of the oncologic process in vivo. Part of the challenge with CTCs resides in the fact that there are very CTCs in cancer patients [range is 5-7 CTCs per 7.5 mls of blood drawn] and that CTC numbers are not generally found elevated in all cancer classes—this may reflect the biology of tumors and mechanisms of generation of CTCs from the tumor mass which may be different depending on the anatomic location of the tumor, its vascularization as well as the dimensions of the tumor. Therefore, CTCs may be an excellent circulating biomarker for specific cancer classes and perhaps not all cancers. Exosomes and other Classes of Extracellular Vesicles (EVs) – This category of circulating biomarkers have received extensive attention of late given the fact that EVs are a reservoir of circulating biomarkers (protein and RNAs are well documented; DNA is more controversial) and are very abundant in the blood (estimated at 1010-1011 vesicles per ml). Exosomes can be isolated from biofluids and their biomarker cargo studied—this has been accomplished in numerous studies and has demonstrated that indeed EVs can serve as circulating biomarkers and can provide a comprehensive picture of the in vivo milieu – exosome-derived RNA contains both large RNA species as well as small RNAs such as microRNAs. Chart 1. Candidates for Liquid Biopsy Development. Source: Enal Razvi, PhD, Select Biosciences, Inc. Chart 2. A Comparison of Various Circulating Biomarker Classes and Associated Characteristics. We’ve found that the companies providing solid tumor profiling based on next generation sequencing and other approaches, such as Foundation Medicine, Genomic Health, Guardant Health are starting to work on liquid biopsies. This suggests that liquid biopsies will gain acceptance into the mainstream of cancer diagnostics in the future and perhaps expand into other disease classes such as cardiovascular disease, CNS diseases amongst others. Stay tuned, this is a rapidly expanding and evolving field. Chart 3. 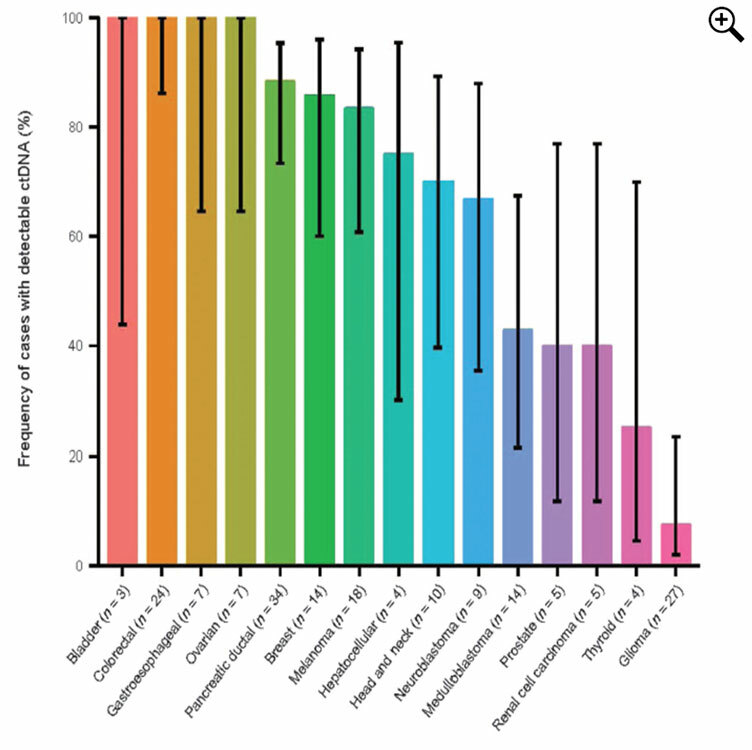 Clinical Utility of ctDNA In Various Cancer Classes: Note that many cancers demonstrate detectable ctDNA, i.e., the use of ctDNA for disease monitoring is potentially across many cancer classes. Source: Luis Diaz et al., www.ScienceTranslationalMedicine.org 19 February 2014 Vol 6 Issue 224 224ra24.